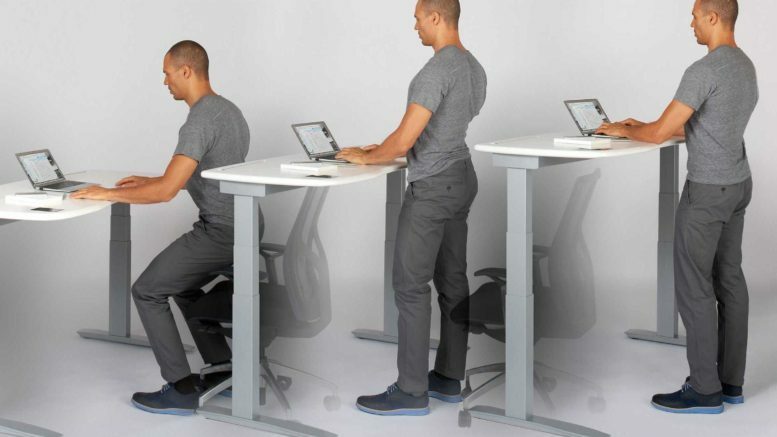 A demonstration of the standing desk. Big development out of Bismarck today: Governor Doug Burgum indicates he may use a standing desk to accomplish his duties. In fact, there isn’t really any evidence that standing is better than sitting, Verbeek adds. The extra calories you burn from standing over sitting for a day are barely enough to cover a couple of banana chips. “The idea you should be standing four hours a day? There’s no real evidence for that,” he says. “I would say that there’s evidence that standing can be bad for your health.” A 2005 study in Denmark showed prolonged standing at work led to a higher hospitalization risk for enlarged veins. Is Gov Burgum’s No-Salary Stunt Costing Taxpayers More? Be the first to comment on "Gov Burgum: I Might Use a Standing Desk"